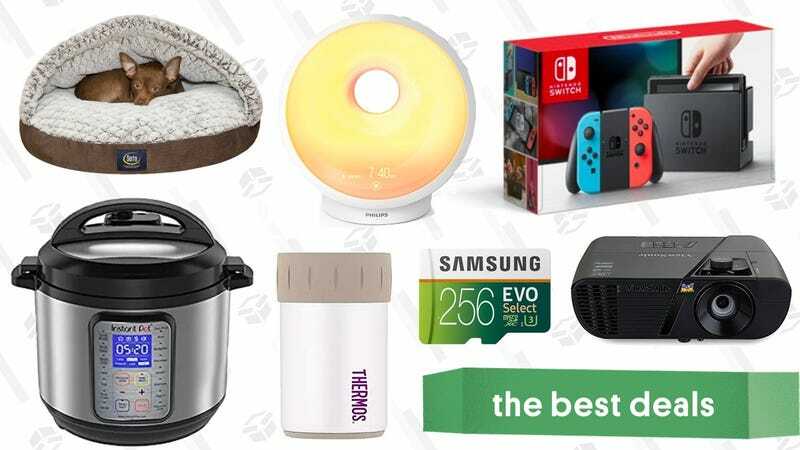 Prime Day’s over but there are still plenty of deals out there. Pick up discounts on a Nintendo Switch bundle, an Instant Pot DUO Plus, a ViewSonic 1080p projector, and much more. This 4TB desktop hard drive from WD dropped to $80 for Prime Day, and amazingly enough, it’s still on sale for that all-time low price. Because this is a desktop drive, it’ll need to be plugged into an AC outlet to function, but you can’t do much better than $20 per terabyte. Anker’s “official” Prime Day deals are gone now, but you can still take advantage of their Kinja Deals reader exclusives, listed below. There are too many deals to list them all here, but you can find them all at this post. Buy a $90 eBay gift card on eBay so you can save more money next time you shop on eBay. eBay! If you thought the end of Prime Day meant the end of microSD card deals for awhile, think again. This 256GB Samsung U3 card just dropped to $90, the first time it’s ever sold for under $100. If you buy a Nintendo Switch today, you should buy this too. DJI’s Spark quadcopter arguably offers the best combination of ease, image quality, and price out there right now, and you can grab the Fly More combo from Amazon right now for $499. The Spark is roughly the size and weight of those cheap toy drones you see out there, but with significantly better flight time and performance, an automatic follow-me mode, and most crucially of all, a gimbal-stabilized 1080p camera that shoots some seriously great footage. The combo includes an extra battery, propeller guards, a charging hub, and crucially, a high-powered remote control with range of over a mile, compared to ~100 yards with just your smartphone. Update: Also available refurbished from Newegg for $349. If you’re ready to make the leap to a projector-based home theater, but your budget is tight, you won’t find a better value than this $400 ViewSonic. Today’s deal is $10o less than you’ll find elsewhere around the web, and a great bargain for a 1080p projector with a respectably bright 2200 lumen bulb, which is plenty bright to enjoy your home theater in the daytime, especially with the curtains drawn. Just note that it’s only available today, and could very well sell out early. If that won’t be quite enough for your, this 4K ViewSonic with a 3500 lumen bulb is still on sale for $1,000, the same price as Prime Day. The best Prime Day deals aren’t limited to just Amazon; Walmart’s taking $20 off the GoPro Hero action cam today, and throwing in a $25 gift card for good measure. It doesn’t shoot in 4K, but it does have a built in touchscreen and can go underwater without any additional housing, making it more than enough action cam for most people. If you’re ready to make the leap to a projector-based home theater, you won’t find a better deal to get you started than this $1,000 4K ViewSonic projector. Today’s deal is $300 less than you’ll find elsewhere around the web, and a great bargain for a 4K projector with a blindingly bright 3500 lumen bulb, which is plenty bright to enjoy your home theater in the middle of a sunny day. Just note that it’s only available today, and could very well sell out early. With its ability to work on any surface, including glass, the Logitech MX Anywhere mouse has always been a reader favorite. And today, you can save on its sequel. All the features you know and love from the original are still here, but the MX Anywhere 2S adds in Logitech’s new FLOW cross-computer control, which lets you use one mouse to control multiple computers at once, and even copy and paste content between them. Even if you never use that feature though, it’s a great mouse with 70 day battery life, a best-in-class sensor, and easy Bluetooth or USB pairing to up to three devices. Not bad for $50, within about $1 of an all-time low. If your pups enjoy burrowing under blankets, you can treat them to this discounted Serta dog bed with a hooded canopy from Woot. You can pick between the 20" or 25" bed with a few color options. For today only, it’ll cost you just 20 bones, which is about $20 less than its Amazon price. If you want to plan a trip for the fall, this Icelandair sale means it could be cheaper to fly to Europe than to a city on this side of the Atlantic. Prices vary by date and location, but this page provides a chart of the available departure and destination airports, and below that, you’ll find a list of eligible dates based on your itinerary. Just to test it this deal out, I looked for a roundtrip flight in September from New York to Amsterdam, and the chart said the best available price should be $339. However, the dates I put in came out to just $309 roundtrip, with a lot of departure times available for the same price, so be on the lookout for even better deals. In addition to the cool, donut-like design, the high end Philips Somneo includes tons of lighting options, built-in white noise, a breathing relaxation mode that you can use when going to sleep at night, a USB charging port for your phone, and a bunch of wake-up sounds. The best feature though? <Music from a heavenly choir rains down from the sky> An eight hour battery backup so a power outage won’t mess up your alarm! Finally! This isn’t quite an all-time low price, but it’s been selling for $180 for the last few months, so this is a precipitous price drop. If you’re sick of renting carpet washers every time you spot a new stain, you can buy your own for $103 today. The Bissell SpotClean has a squeaky-clean 4.2 star review average from nearly 4,000 customers, and includes a number of tools for floors, stairs, and furniture. While today’s price isn’t an all-time low, it is the best Amazon’s listed since 2016. Update: Here are a couple more weighted blankets on sale. You’ll pay $4 less for this 15 pound one in light grey- it’s just $71 right now, just be sure to clip the on-page 10% off coupon. In addition to keeping you warm, weighted blankets can work wonders for your anxiety. Just imagine the heavy bib they put on your chest at the dentist when you get X-rays. Feels nice, right? Now imagine a softer version of that over your entire body. A decent set of mixing bowls is a kitchen necessity. If yours are in need of replacement, these popular OXO bowls are a good option. They have non-slip bottoms, convenient pour spouts, and at $5 off today, they’re hard to pass up. Full of lunch boxes, food jars, and other items for kids, this Gold Box is meant for parents who are Back to School shopping. But there are some items that could be good to take to the office too. This Thermos 32 oz Element has a wide enough mouth so you can fit in ice cubes, plus it has never been cheaper. This sale ends at midnight, so pick up what you need before it ends! The $59 Instant Pot Duo is still sold out, but the Instant Pot Ultra is on sale in two different sizes for Prime Day. Unfortunately, neither of those sizes is the standard 6 qt., but if you need the apartment-friendly 3 qt. or the family-sized 8 qt., you’re in luck. In addition to pressure cooking (which is a miracle), this is also our readers’ favorite slow cooker, and one of their favorite rice cookers too. To put a fine point on it: It’s one of the most versatile kitchen gadgets you can own. The Ultra models have a much better UI and controls than the standard Duo, plus a pressure valve that automatically closes itself when you close the pot, so you’ll never forget to set it. Don’t need the fancy Ultra controls? The 3 qt. Duo is also down to $60. It’s a matter of taste, but some might say that the new, cheaper Nest Thermostat E is even nicer looking than the original, while still packing in almost all of the original model’s features. It’s a bargain at its usual $169, but today you can also get a free Google Home Mini when you buy it from Walmart. We saw this same bundle for $149 a few weeks ago, but this is still a really solid deal if you missed out. Smart outlet switches have become the atomic unit of smart home gadgetry, and you can get stock up on Etekcity models with Alexa support and even energy monitoring for Prime Day. Prices start at $25 for two of them, but the more you buy, the lower the unit cost will drop. Anova dominates the sales charts, but in many ways (raw heating power, looks, size, software quality), the Joule sous-vide circulator is actually the superior product, and it’s cheaper than ever for Prime Day. Though the Joule White and the Joule White/Stainless are priced different, they’re completely identical products save for the stainless steel accents, so I’d buy the cheaper one if it’s still in stock. This 22” TravelPro carry-on bag is the same brand as our readers’ pick for the best carry-on luggage, and the perfect companion for your upcoming summer trips. Today’s $200 price tag is the lowest we’ve seen in 6 months, and $50 less than usual. $200 is still a lot to spend on a small bag, but with great reviews and a lifetime warranty, you can consider it an investment. You’ve seen the Shark Tank segment. You’ve seen the infomercials. Now try the Simply Fit board for yourself for just $20, an all-time low. Hope you like orange! William Painter probably doesn’t need to run a Kickstarter to launch new glasses, they’ve been around the block, and their wares are extremely popular. But lucky you, you can preorder their new Oasis line to save big over the MSRP. The Oasis combines a well-built plastic front face with a titanium frame, plus polarized lenses that are basically unbreakable. The combination of plastic and metal (both available in multiples colors) creates an interesting look that I haven’t seen many other places, and while style is subjective, I’m a fan. 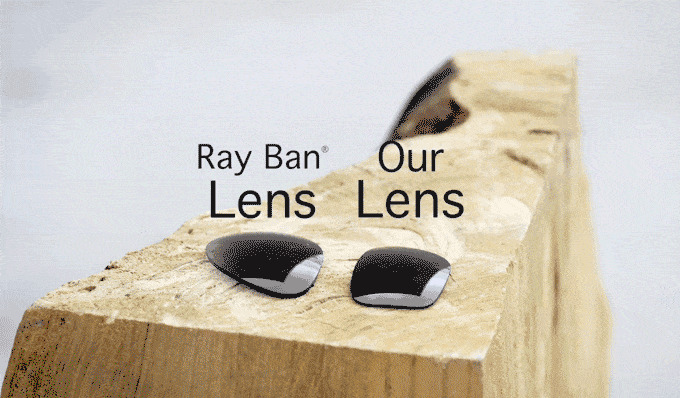 The samples they sent me feel extremely solid, and the lenses, while plastic, are of excellent quality. The campaign has already raised about 10x its original funding goal with a month still to go, and you can get in on the savings with expected delivery in December. Shaving is a very annoying chore that will hopefully go the way of the vacuum cleaner and be outsourced to robots very soon. Until that time, you can pick up these discounted Remington electric foil razors from Amazon. The men’s is just $19 today, and can provide up to 20 days of shaving in between charges. The women’s includes a $15 off coupon and an attachment to shave your bikini area. Both prices are all-time lows, so what are you waiting for? Yunmai’s smart bathroom scale is one of the most popular scales on Amazon, and at $25 with promo code DEALYM98, it’s also one of the cheapest smart scales we’ve ever seen. Just pair the scale with your phone over Bluetooth, and the scale can sync your stats to Apple HealthKit, Google Fit, and even the Fitbit app. Standing desks are great for you, but adding a balance board to the mix is a low-intensity way of strengthening your core and leg muscles while you fill out spreadsheets and expense reports. This one from Gaiam is designed specifically for standing desks, and it’s 30% off today with promo code BALANCEBOARD30. Hike into this Amazon sale on camping gear featuring big name brands like Camelbak, Igloo, Zippo, Stanley and more. Most things are discounted around 30%. There’s a lot to look through, so if you’re looking for suggestions, I like this rugged Igloo cooler (only $15), this CamelBak hydration vest is marked down to just $63 (down from $90) and this $9 Zippo flex neck lighter is a no-brainer. And there’s more where that came from, head over to Amazon to see it all. Target may be a vast, black hole in which you end up with 17 things that you didn’t come for, and none of what you did, but it sure knows how to give good deals. Right now, they’re taking up to 40% off clothing for the entire family. No code needed, just add to your cart and quickly check out before you realize you put a 12-pack of Cheetos and a blender in there too. J.Crew Factory is back with another extra discount on sale items. Use the code EXTRA50 and pick up an extra 50% off their entire clearance section. There are a ton of summer-ready button down, dresses, shoes, and more to choose from. Need Supply, the Richmond, VA shop for everything trendy and cool, is having a sweet sale. Right now, they’re giving you an extra 20% off select sale styles thanks to their huge Summer Sale. Use the code TAKE20 and stock up on minimalist staples, or some really great beauty steals. There are two Planet Earth deals in orbit right now; Planet Earth II in 4K Ultra HD or Planet Earth I & II Blu-ray gift set. At $29 and $35 respectively, both are within $1 of their historic low prices. I’d suggested cuddling up under your weighted blanket and settling in for a movie binge. Cuphead was simultaneously one of the best looking and most brutally challenging games of 2017, and you can pick up a PC download from Humble today for $16. Don’t say I didn’t warn you. With Xbox Game Pass, Microsoft basically created the Netflix of video games, and it’s a great deal at its usual $10 per month. But for a limited time, that same $10 will get you three months of the service. Xbox Game Pass grants you access to new releases like State of Decay 2 and Sea of Thieves, as well as classics like KOTOR and all of the Gears of War games. The only catch is that you’ll be auto-renewed at $30 per three months after your first three months is up, so remember to cancel if you don’t want to keep paying. Remember back in the day, when you could get a year of Xbox Live Gold for $40 pretty much any time you wanted? Well, Microsoft’s kicking it old school right now, so re-up your membership at this price while you can, even if it won’t expire for awhile, because it’s almost definitely not going to get cheaper than this any time soon.